Latvia has a rich culture that is influenced by the varied historical heritage of the nation. 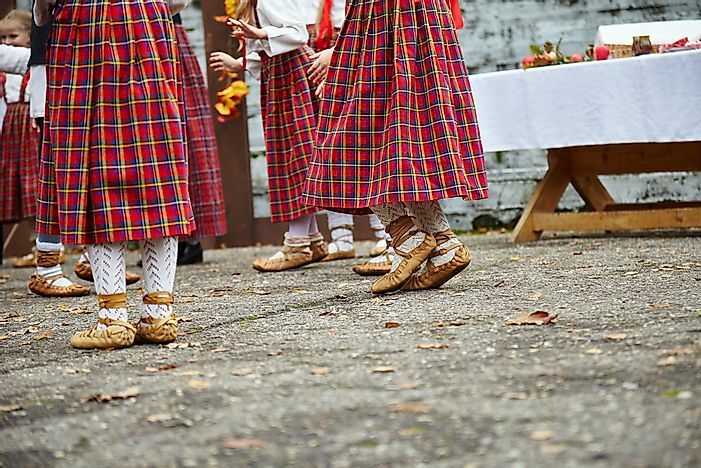 Women dressed in traditional Latvian dance shoes. Latvia, one of the Baltic states of Northern Europe, has a rich history of that has led to its current unique culture. Most of the people of this country have a shared belief in its folklore, which tends to describe the lifestyle of ancient Latvia. The principal characters of these stories generally have deity status and provide strength or courage to people who wear their symbols. Latvia has a number of other customs, including the incorporation of yeast breads in almost all family celebrations and the widespread availability of artisan markets in many of the towns here. This article takes a closer look at some of the specific characteristics of the culture of Latvia. Because Latvia is located along the Baltic Sea, fish (especially smoked and raw) play an important role in its traditional cuisine. Additionally, many of dishes served in this country can only be found during certain times of the year as many ingredients are only available in specific seasons. Some of the most common ingredients include: wheat, barley, potatoes, cabbage, eggs, and onions. Meat plays a central role in many of the dishes, particularly pork. Latvian cuisine is known to be high in butter content and makes use of dill, caraway, and black pepper. It is rarely spicy. Dairy products are also very common in this country, especially sour cream, cottage cheese, and soured milk. As previously mentioned, yeast bread is considered a dietary staple in this country and rupjmaize is the most popular. This particular type of bread is made of rye. Sklandrausis, a sweet pie, is another popular dish. It consists of a rye crust filled with a mashed potato, carrot, sugar, and caraway filling. The traditional folk clothing of Latvia varies from region to region and is often used during celebrations and other festivities. Clothing style here was significantly influenced by German styles during the 20th century and introduced knitted socks, gloves, and mittens. Traditional colors include red, blue, grey, green, and cream. Shirts are the basis of Latvian outfits. Women, for example, where shirts that reach to knee-length. These serve as both a shirt and petticoat. Skirts, jackets, and bodices are worn over top of the shirts. Men wear similarly long shirts topped with a vest and overcoat (either short or long). Typical head coverings include: crowns for unmarried teenagers and young women and head scarves for married women. Both men and women wear long, woven, colorful belts. Traditional Latvian music dates back to the pre-Christian era over a thousand years ago and features dainas, traditional poetry sung in drone vocal style. The themes of dainas are centered around popular folk legends, native mythological stories, or traditional lifestyles. Ancient deities, births, weddings, and funerals take center stage of these songs. Dainas have only a few stanzas, which are typically short in length with unrhyming lyrics. These songs are accompanied by the music of traditional instruments, particularly kokles. Kokles are stringed instruments that are laid flat and plucked on a table or lap. Folk dancing in Latvia has evolved from the dancing styles of the Baltic people, who immigrated to this region around 2000 BC. Like the dainas, these dances are representative of traditional daily life and celebratory events. Many of the dances are performed in groups of multiple couples (usually 4) and involve switching partners. It has often been compared to square dancing. Literature in this country is rooted in its folk songs and music. Its literary tradition is said to have begun in 1856, when the poetry book Songs by Juris Alunans was published. Nearly 30 years later, Lacplesis was published; today, this work is considered the national epic of Latvia. During the early 20th century, literary themes were influenced by a wide range of political movements, including socialism and Marxism. During World War II, many Latvian authors left the country to emigrate to Sweden. Latvian works were primarily written here published and later published in Stockholm, New York City, and London. Today, some of the most well-known Latvian writers include: Nora Ikstena, Eduards Aivars, Laima Muktupavela, and Anna Auzina. Works of art created from the 1700’s until now can be seen at the National Museum of Art, located in Riga. It houses over 52,000 pieces, providing a look at the the evolution of artwork over the last 300 years. The most widely practiced religion in Latvia is Christianity, with 70% of the population identifying as Christian. Lutheranism is the most popular denomination (34.3%) followed by Roman Catholicism (25.1%). Despite this high percentage, only 7% of the population reports attending church services. Historically, this country was one of the last in Europe to be introduced to Christianity and indigenous religions remained commonly practiced throughout rural regions until around the 1600’s. Today, the majority of the people of Latvia celebrate the two Christian holidays: Christmas and Easter. Each celebration, however, continues to be influenced by pagan roots. Christmas, for example, is a combined holiday that honors both the birthday of Jesus and the winter solstice. Easter is also celebrated with pagan rituals and marks the spring equinox. The celebration includes a number of customs related to eggs, which date back to before Easter. One of the largest festivals to take place here is known as the Latvian Song and Dance Festival, which was first celebrated in 1873. It is considered one of the important cultural events in the country and one of the largest amateur choir events in the world. Approximately 30,000 participants take part in the festival, singing folksongs, classical choir songs, and a capella style. Additionally, this festival offers spectators other activities, including: a large parade, arts and crafts exhibits, works of photography, and orchestras. Martial arts are widely practiced throughout Latvia as well. This includes mixed martial arts, kickboxing, wrestling, boxing, and judo. Igors Kostins, Konstantin Gluhov, Raivis Vidzis, and Misha Cirkunov. Of these individuals, Misha Cirkunov participates in the Ultimate Fighting Championship (UFC) in the light heavyweight division. He was born in Latvia of Russian descent, but currently lives in Canada.